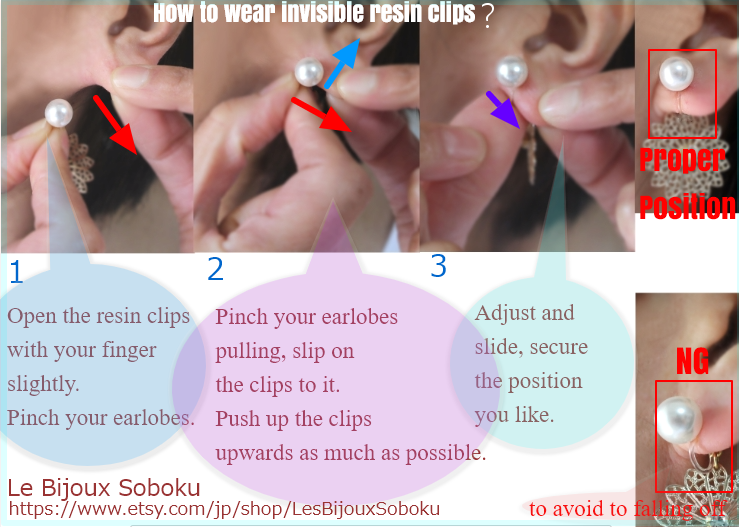 How to wear invisible resin clips ? 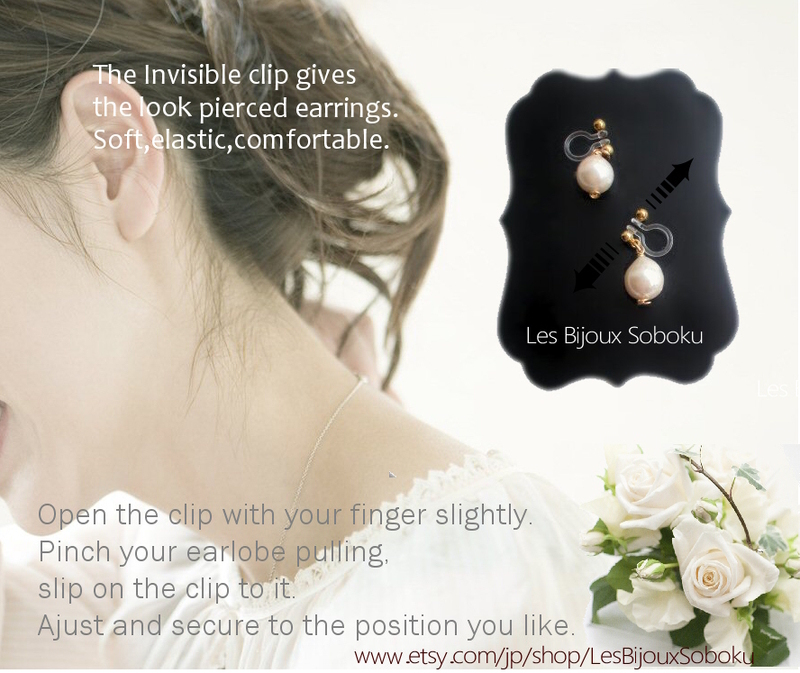 The invisible clip on earrings have been popular in recent years not only Japan, but all over the world. They say the omega resin clip on earrings are a kind of small Japanese innovation for women who like to wear earrings. I do not get my ears pierced because I have thick earlobes and a kind of allergy. I wished I could put pierced earrings which is so stylish, lightweight. Unfortunately, I couldn't so I used the metal screw back clip-on earrings before I got know Invisible omega clip-on earrings. They are bulky, also sometimes feel uncomfortable, so I had to loosen the screw on them to adjust. Then they fall off easily, but I kept using them because they were the most comfortable earrings I had ever known. 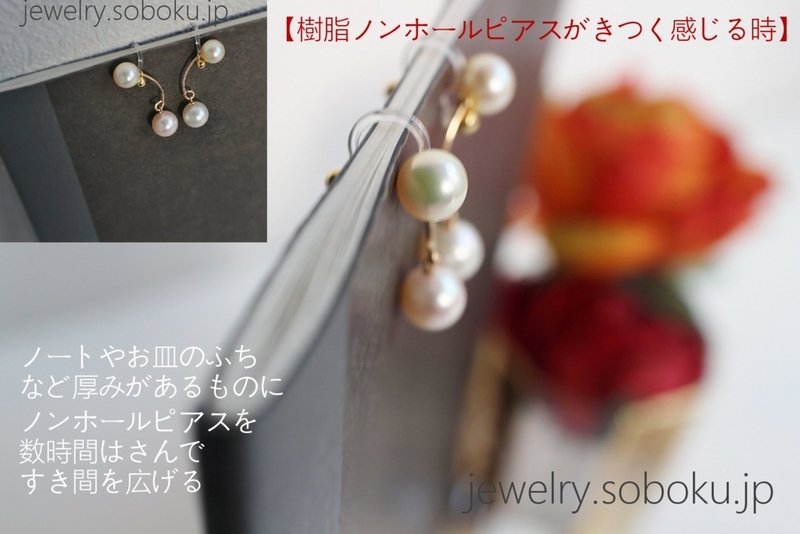 After I met the these Japanese Invisible resin clip-on earrings, I was forgetting about the metal clip on anymore. The Invisible omega clip on earrings are so comfortable to wear, look like a pierced earrings! These clip on earrings look just like pierced earrings because the resin clip is clear in color which makes it transparent and invisible. Also They are very lightweight and comfortable to wear even all day.They look almost same as pierced earrings. Their shape is soft, elastic and comfortable. Many women who use metal clips we are all familiar with might say "I won't be able to back again," As you know, the regular metal clip on earrings are bulky and heavy to wear daily. Since they are made of metal, they could trigger allergy to certain people. 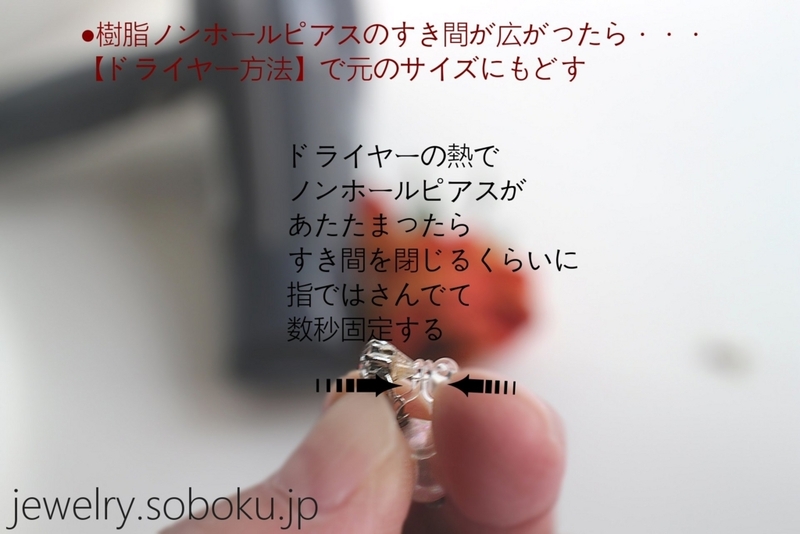 But these Invisible clips are made of flexible and transparent resin. So it looks like you're wearing regular pierced earrings. They are more comfortable to wear, sophisticated, fit your earlobes gently. They will stay on will not fall off easily. Those who have allergy, sensitive skins, or feel stress with pierced hole, that means from kids to adult everyone can wear these earrings! 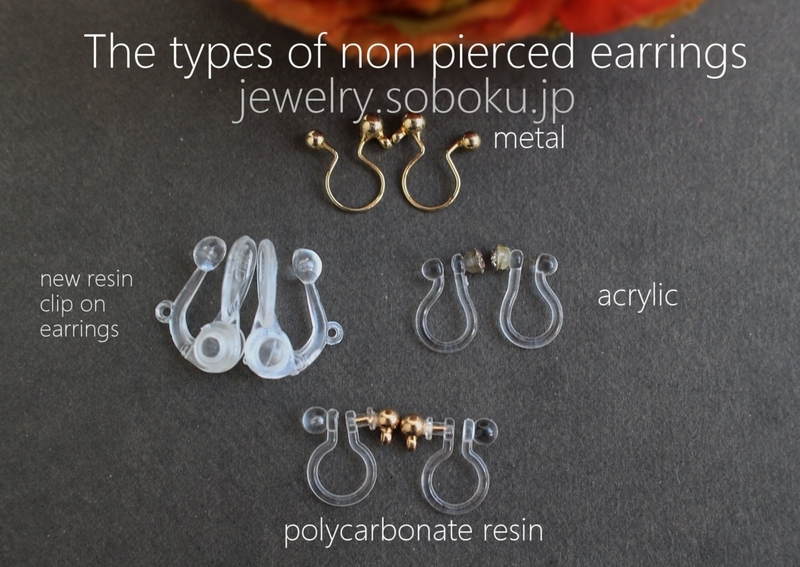 In Japan they are becoming more common now days.There are several types of resin clips. The most of material of invisible clips is acrylic resin, metal, polycarbonate resin. I would recommend the polycarbonate resin clips. The polycarbonate resin is used for like a sports sunglasses which means they are soft and strong, holds ear lobes gently. I feel uncomfortable and pain soon when I try on the invisible clips made of acrylic which are selling at discount shop in Japan. Open the resin clips with your finger slightly. Pinch your earlobes pulling, slip on the clips to it. Push up the omega clips upwards as much as possible, so you won't loose the clip ons. Adjust and secure the position you like. Find the way that is easiest for you. Please handle these omega clips with care, try not to widen or twist too much. Refrain from touching resin clip with nail polish remover. It will broke easily. Try to handle these clips with care, not to widen or twist too much otherwise the clips will damage. 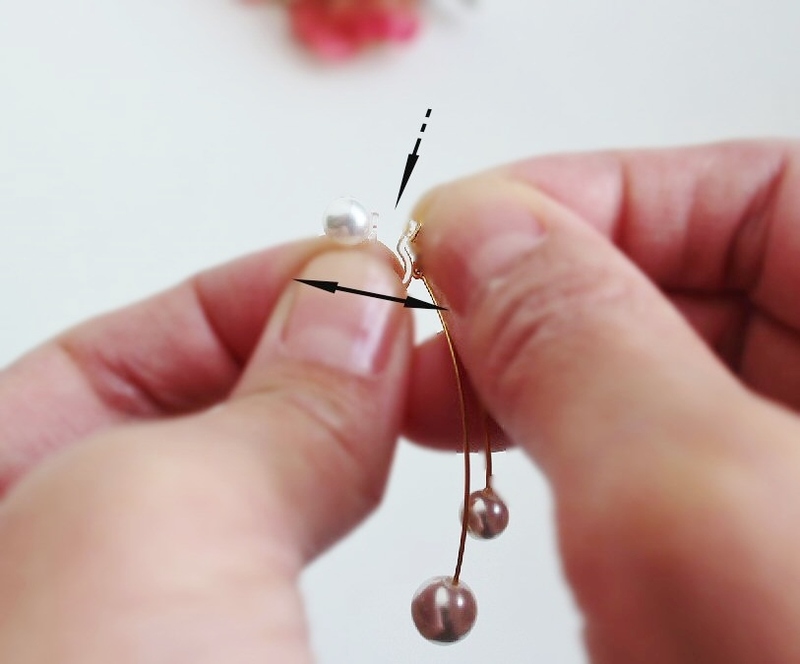 There’s nothing more frustrating than realizing you’ve lost an earring.These invisible clip ons too.The important things to avoid to falling off is 3. Try to push up the clips of omega upwards on your earlobe as much as possible to secure.That is a tip to keep you from losing invisible clip on earring. Next, there are tips for invisible clip on earrings's trouble. For the invisible clip on earrings, They look almost same as pierced earrings. This omega shape resin clip is soft, elastic and invisible, comfortable. Although it is quite familiar the invisible resin clip ons, there are individual differences in the shape and thickness of the ear lobes as well, so that troubles may occur depending on respective ear lobe circumstances. Here are the tips how to deal with such invisible clip ons when you feel tight or loose. I actually have a thick ear lobes.In my case, after 6 ,7 hours, I gradually begin feeling uncomfortable in my earlobes. In such a case, I remove them, rest my earlobe, or shift the position to wear to inside. They say it is feels pain less when you wear clip on earrings inside of the ear lobe than normal position. Before using the resin omega clips, I usually make more space between clips as the picture shows.So I can wear them comfrotable with no trouble. Place them with the edge of a plate, somewhere thick notebook for several hours to the gap is widened a little bit.But if it spreads too much, it becomes easy to fall off, so proper adjustment is necessary. People who have extremely thin ear lobes may feel easy to loose even in a brand new condition. Or continue to be using of them, the space of omega may getting spread. To make them back to the original, apply a hot air to the resin part to warm. 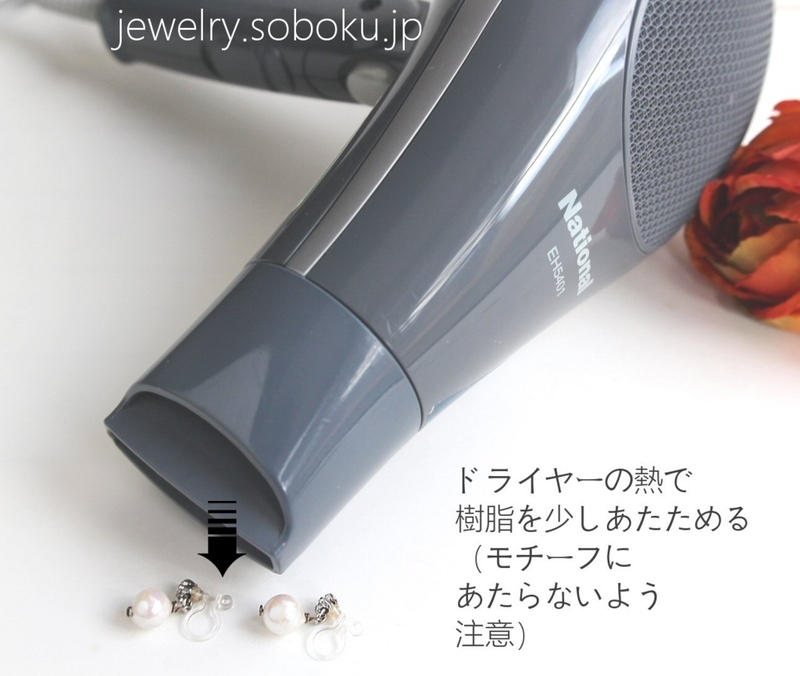 Avoid to aplly hot air except of resin parts like pearls.Cover the parts that you do not want to blow hot air with cloth. The chopsticks might be usefull to pinch them. Looking for Invisible clip on earrrigs nicer? You will be able to try ear jacket, double sided, front back earrings too. I myself a these resin clip ons user, also jewelry designer. I sell my non pierced clip on earrings on Ety below. Now there so many jewelry shops who sell those invisible clip on earrings in Etsy.So why don't you visit them to find out new style or earrings' world. These earrings might be life changing.